in the summer I love this beverage it is a lime, watermelon, strawberry and coconut water cooler . It is similar to a slushie. 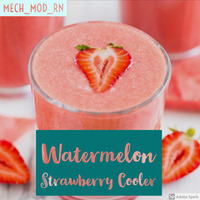 This recipe is the property of MECH_MOD_RN and released under the CC Attribution-NonCommercial-Sharealike 4.0 license. You may not copy, derive or commercialize this recipe without following the terms of this license or the explicit permission of the creator.